Oleavine Therapeutic Soap is great because it has so many uses. 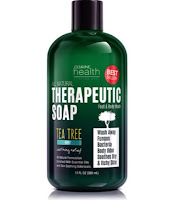 This soap contains a large amount of Tea Tree Oil in it, which is for medicinal purposes. It also contains mint. The soap works to help treat ringworm, athlete's foot, dandruff, eczema, dry skin, jock itch, acne, toenail and nail fungus, yeast, and other body problems. It also works to treat odor problems. It contains only natural and therapeutic ingredients. There are no dyes, preservatives, harmful chemicals or detergents. This soap is safe for any skin type. It works wonders on so many different skin complaints and is a miracle soap.